This year, the Israeli settlement in the heart of the city of Hebron marked its 50th year. Over the years, due to the Israeli government’s actions, the settlement movement, and the IDF’s heavy presence, the city center of Hebron – one of the largest Palestinian cities in the West Bank – has turned into a ghost town, almost completely devoid of Palestinians. From the invasion of the Park Hotel by Rabbi Levinger and his students in April of 1968; the takeover of Beit Hadassah in April of 1979; the massacre committed by Baruch Goldstein at the Tomb of the Patriarchs in February of 1994; and to date, the story of the settlement in Hebron faithfully represents the story of the occupation at large. In the past, settlers’ daily violence and disregard for the rule of law, the deprivation of Palestinians’ most basic rights, and the ongoing actions of soldiers maintaining this oppressive system were considered stains worth trying to conceal. However, in recent years it seems as though we have shed our pretense and sense of shame. Instead of striving to change the reality, the Israeli government has been working to strengthen and deepen the Israeli settlement in the heart of the Palestinian city. 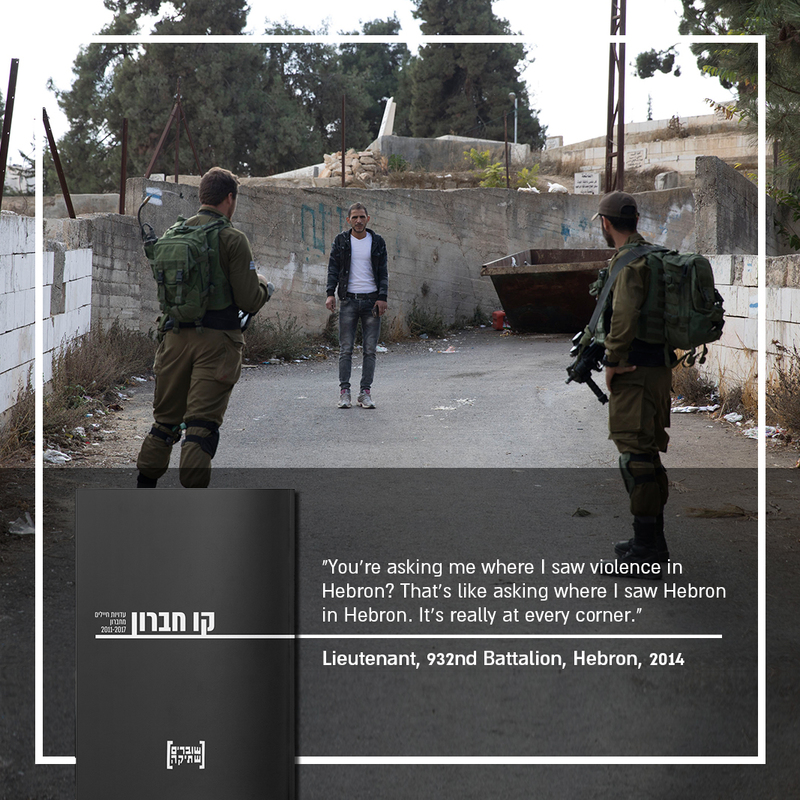 This booklet of testimonies intends to offer a glimpse of the daily reality in Hebron from the point of view of the soldiers who served there. 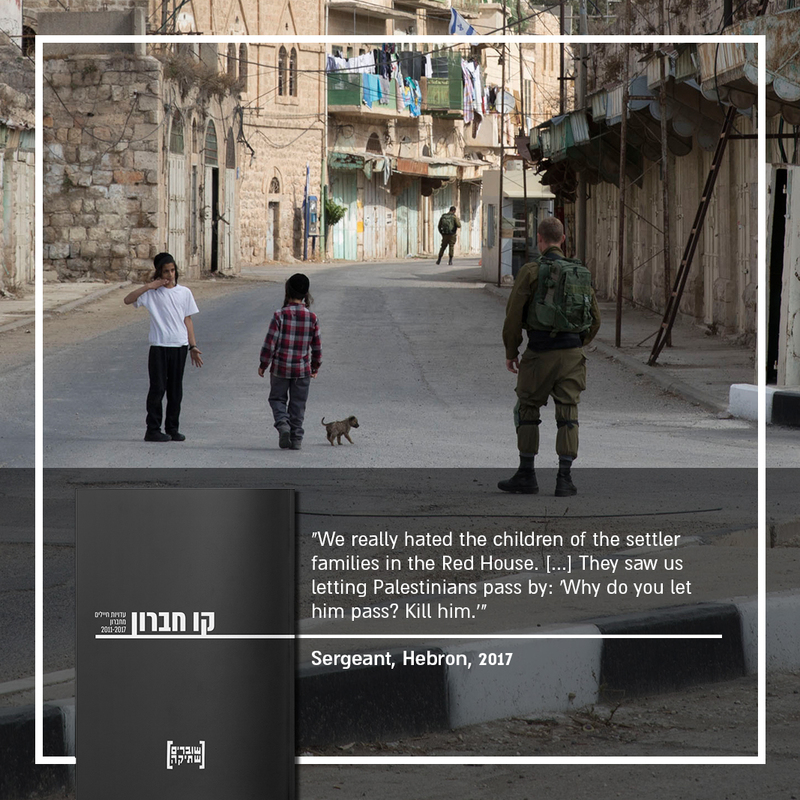 This is the fourth booklet of testimonies that Breaking the Silence has devoted to Hebron, and it is comprised of testimonies from soldiers who served there at some point between the years 2011-2017.
to our new booklet of testimonies! Breaking the Silence (BTS) is an organization of veteran combatants who have served in the Israeli military since the start of the Second Intifada, and have taken it upon themselves to expose the Israeli public to the reality of everyday life in the Occupied Territories. They endeavor to stimulate public debate about the price paid for a reality in which young soldiers face a civilian population on a daily basis, and are engaged in the control of that population’s everyday life. Their work aims to bring an end to the occupation. Reposted with permission from BTS.